This tutorial is the first lesson in the series of robot navigation. We consider the case of an open space with no obstacles. The objective of this tutorial is to learn how to make the Turtlebot robot move using ROS. You will mainly learn how to publish a velocity message to make the robot move for a certain distance, or rotate for a certain angle. For this, you will create the functions move and rotate using different techniques. In particular, you will learn how to use TF package to estimate the distance traveled by the robot and the angle rotated by the robot using frame transformations. Develop functions to make the robot rotate for a certain angle. The objective is to develop functions to make the robot moves in an open space in straight line for a certain distance, and rotate left or right for certain angle. 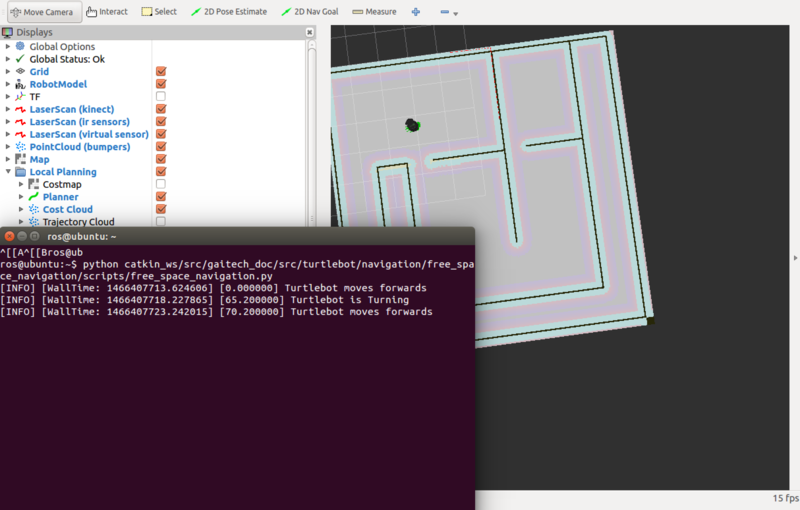 Using these primitives, it is possible to make the robot move in a free space. In Turtlesim Cleaning Application tutorial, we used the simple equation of distance=time*speed to make the robot move to a certain distance. However, this method is not effective in case of a real robot considering the following reason: the inaccuracy of IMU sensor data that provide the speed of the robot in addition to the friction with the ground will compromise the accuracy of the calculated traveled distance in a certain time duration, which results in an estimation error. This issue is even worse in case of rotation. This estimation error will quickly cumulate over time leading to inacceptable localization error. Fortunately, in ROS, there is the frame transformation package, denoted as tf package, that provides several interesting and advanced functionalities to estimate the motion of a frame (in this case the frame attached to the robot), with respect to a fixed frame (i.e the reference frame). In this tutorial, we will use the tf package to estimate the traveled distance of the robot, in addition to the rotated angle of the robot. It is important to have a prior knowledge on frame transformation first to understand the code. Check some online tutorials or ask your instructor. You can find the whole cpp and python files in our GitHub repository. They are located in src/turtlebot/navigation/free_space_navigation. In particular, we will use the launch file free_space_navigation_stage.launch that contains all the needed ROS nodes for this tutorial. Here is the content of the free_space_navigation_stage.launch file. In the code you will find 3 move functions and a rotate function and each one of them has its own approach so you will be able to know 3 different ways of controlling and manipulating the turtlebot robot . The code is also well explained so you can easily understand what each line is doing in the code and what is its functionality. We first analyze the move_v1 function to make the robot moves with a certain speed for a certain distance in stragight line either forward or backward. The following code below sets the linear speed of the x-axis as positive value if the intention is to move forward, and negative value if the robot is to move backward, based on the value of isForward boolean variable. All other linear speeds and angular speeds must be set to zero, because we consider only a straight motion in the x-axis direction. It has to be noted that the x-axis of the linear speed is the axis that points to the front of the robot from its center. //all velocities of other axes must be zero. #all velocities of other axes must be zero. The following code waits for tf::TransformListener listener to find the transformation between the /base_footprint frame and the /odom frame, which represents the reference frame. Then, once the the transformation is found between the two frames, we save its current state into the init_transform which is a tf::StampedTransform object. In simple words, this object captures the relation between the two frames in terms of translation and relative orientation. //Once the transform is found,get the initial_transform transformation. #Once the transform is found,get the initial_transform transformation. The following code estimates the traveled distance. It is known that the distance is sqrt((x1-x0)^2 + (y1-y0)^2). current_transform captures the current transformation between the /base_footprint and /odom frames. Using the tf function getOrigin().x() and getOrigin().y() we can find the x and y coordinates of the frame /base_footprint with respect to /odom frame. Appying the distance equation, we will be able to find to distance traveled by the robot, considering that the init_transform was captured at the moment before starting the motion and that the current_transform was captured at the moment of the motion. Note that in Python, the listener.lookupTransform is used differently. In fact, listener.lookupTransform('/base_footprint', '/odom', rospy.Time(0)) returns the transformation from the source frame /base_footprint to the target frame /odom at rospy.Time(0))rospy.Time(0)), which means the latest transofmration. The transform is returned as a position (x,y,z) denoted as trans, and an orientation quaternion (x,y,z,w), denoted as rot. So, as observed in the code below, trans represents x and trans represents y. Now we will analyze the second approach move_v2 function to make the robot moves with a certain speed for a certain distance in straight line either forward or backward. The second method is based on transformation composition, which is possible in C++. The idea consists in calculating the relative transform, by multiplying the inverse of the initial transform by the current transform. This is known as transform composition property of coordinate systems. Then, we use the relative transform to find the displacement of its origin, which represents the traveled distance of the robot. As for the python code, for now, we did not provide an equivalent function to the second approach in python. The last function we are going to analyze is the move_v3 function to make the robot moves with a certain speed for a certain distance in stragight line either forward or backward. The following code defines the rotate function that gives the robot the ability to turn. It starts by delcaring a Twist message to send velocity commands and a declartion of tf transform listener to listen and capture the transformation between the odom frame and the base_footprint frame. Then change the angles to radians and then start publishing topics according to the right angles until the robot reaches a certain angle. The python code is a little different than the C++ code but it does the same functionality. As for the python, we use (trans,rot) = listener.lookupTransform('/base_footprint', '/odom', rospy.Time(0)) to get the rotation component in the rot variable as quaterion. Then, we extract the yaw component using tf.transformations.euler_from_quaternion(rot) that converts the quaternion into a RPY Euler notation, which will be used to get the yaw value as it represents the orientation of the robot. The yaw is at index 2 of the euler array. or launch the free_space_navigation_stage.launch file to launch the simulators and the cpp node. 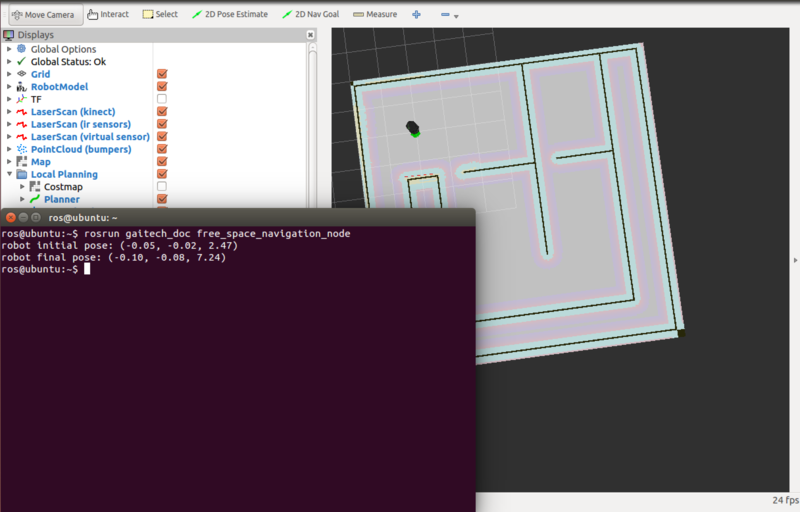 Or you can launch the free_space_navigation_stage_python_node.launch file to run the simulators and the python node. Then run either one of the files as mentioned above.